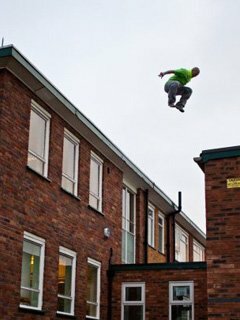 Free running hit Nick's joints hard, so he started lifting on a break from leaping buildings. 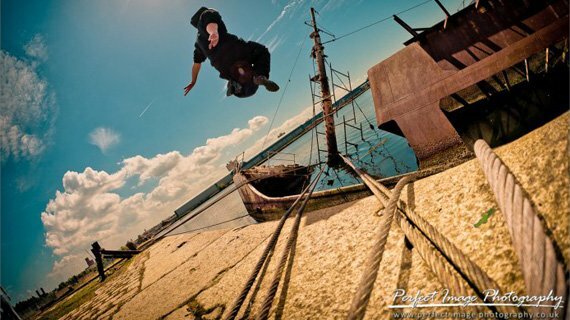 Once he started seeing results, this parkour athlete was hooked. 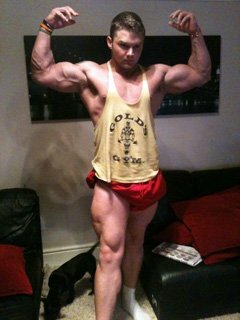 Years Competing: 0 - First competition May 2012. I trained parkour and free running along with gymnastics for 9 years and eventually the heavy impact began to take its toll on my knees, specifically my post patellar tendons. My doctor advised me to take a year out from training or I'd have no option but to go in for surgery on both my knees. Taking his advice I decided to take a year out and allow my knees to hopefully heal. In fear I'd lose my fitness and stamina I joined a local gym to stay fit so I'd be ready to jump straight back in to gymnastics when my knees felt good again. After 8 weeks at the gym I'd already become addicted to lifting. The progression you see in bodybuilding especially in your first 6 months comes so frequent; upping your personal records every other session which is something I'd never experienced with my acrobatic training where we would spend a whole 6 months of training just to progress to the next level and to now come into this whole new world where I can get great feeling of self achievement on a weekly basis. It really got me hooked straight from the go. Around my eighth week at the local gym I decided to move as the weights weren't heavy enough (highest was around 22kg) and they had no barbell or weight plates as it was more of a leisure centre. Shortly after joining my current gym, Total Fitness, I got in to a new circle of friends all with years of experience in fitness, bodybuilding and diet. Soon realizing I was doing a lot of my routines wrong and my diet was poor, I changed everything, fast. Initially I was training my whole body every gym session, everyday - I really had no idea what I was doing until I met the guys at the new gym. I was clueless about diet as I'm sure most of us are when we begin and even now I'm still learning more every day. It really is a constant learning experience in this lifestyle and I don't think I'll ever get to the point where I believe I know everything that's necessary. It's all been a massive learning curve for me but the only thing I have never changed is my outlook on lifting. I've always gone heavy for 8-12 reps, never really more or less and I've stuck to this the entire 12 months I've been working out. 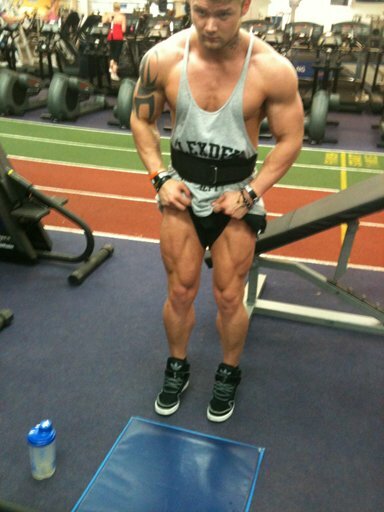 I have no real plan to change that whilst I now embark on my first cut leading to competition. My strength will lessen naturally with the drop in carbs but I'll let that happen gradually and still get my 8-12. 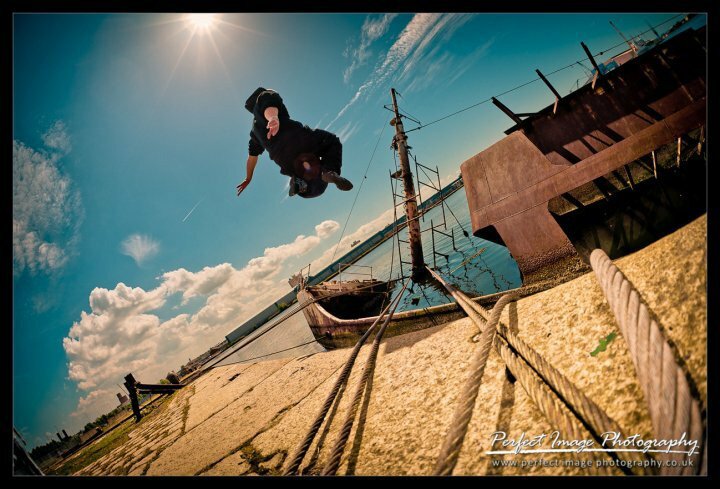 Defying physics with an impressive physique. I've never really used a specific diet plan, just trial and error mostly. In my off season I followed about 2.5g carb per pound of bodyweight and 1.5g protein per pound bodyweight. Now having just begun my cut I'm running about 1.2g carb per pound and 1.8g protein per pound. JST's NOMAX pre-workout has really improved my workouts since using it. For dieting, the only supplement I've only ever used Optimum Whey Protein and for bulking my weight gainer is USN's Hyperbolic Mass. I love bodybuilding mostly for the rewarding feeling of achieving new personal bests with my lifts and generally seeing progression with my body every couple of months. I also enjoy the satisfying feeling of getting home after a grueling session in the gym and collapsing onto the sofa to relax, there's no better feeling than knowing you've just given it your 110% no matter what sport or art form you practice! Mostly my training circle of friends, a few I'd like to give a mention and a massive thanks to whilst I have this great opportunity to feature on BB.com. Jack Greany (Training Partner), Joe Egerton (Coach), Nathan Smith (Diet Advisor), Trev Goodwin & T-Nutrition (Sponsor) and all my other friends - massive thanks for keeping me going guys, wouldn't have lasted half this long without you. Initially the drive to stay in shape but gradually grew hooked on training and learning about the body in the general. My main drive to achieve now is to make my friends and training team proud of me. After the help and support they've given me this last year I feel I owe it to them to do well. Just to carry on as I have done these last 12 months, keep learning, keep growing and keep loving bodybuilding. I have my first competition in 3 months time so we'll see where that takes me but even in the scenario I don't do as well as I'd hope - I'll train harder, diet harder, condition harder and be back for more the following year! Consistency in diet - if there's one thing I've learnt so far it's that consistency is the key. I have friends who I started out with who were pretty much equal to me in height as well as weight and have trained with me almost daily for the last 12 months, same exercises, same routines. However I've always kept my food intake up and I now find myself a good 20lbs heavier than the guys I started out with. You have to eat in order to grow - don't be scared to put that little bit of extra fat on in the off season. 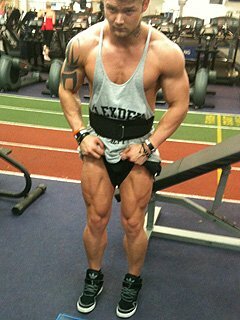 My favorite competitor in Bodybuilding has to be Flex Lewis, from the interviews I've seen with him he seems like such a modest genuine guy and his physique and size are amazing. I admire Coleman, Wolf, Khan and Cutler as much as everybody else but after seeing them all in person I think they're TOO big - I think the only two Olympia standard pros who I think pull off that huge look are Phil and Kai. I mostly follow amateur of the week and teen of the week, I enjoy seeing people around the same kind of experience as me and reading what their views are on training and I try to find any ideas I can use for my own routine. I'll often look over the transformation section though as there truly are some incredible before and after photos on there who I have massive respect for.